Cue the Frames wallpaper that I had earmarked for some spot in the girl’s rooms. The ever genius Lynne mentioned in the comments that she was considering this paper for her laundry room, and well (with the above in mind), I sort of "stole" her idea. Thanks Lynne! Honestly, as all good wallpaper is wont to do, the paper sort of transformed the room…We’ve only hung a few old family snapshots in the little frame outlines for now, but I’m really excited to see this take shape as a sort of laundry room gallery. this just keeps me giddy! well done, you! Love this. If my laundry room looked like this, perhaps I would do more ironing. So fun! And it probably makes the laundry less onerous as well. I love, love, love this so much and you have inspired me! Brilliant! Im posting a laundry room gallery today or tomorrow and this is so going in it!!! I LOVE IT!!!!! Seeing it in your room has made me extra wanting to do it!!! you're a total genius. everything you do is amazing...seriously, i'd live in your laundry room! 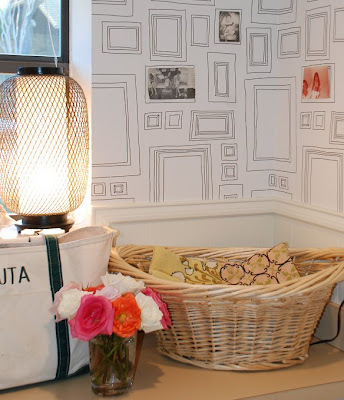 i love the paper - and a laundry room seems like a really great place for something like that. a smaller room with a not-so-creative (or creatively overwhelming purpose) - I'd say like a bathroom, but I'm not sure how well this would fly in there. Anyways, love it - I'm sure your girls (and erin!) will make it a masterpiece! Absolutely LOVE it!! What a phenomenally great idea you and Lynne had! This reminds me of the Sharpie basement... A man in Kentucky decorated his finished basement walls with a Sharpie, and it looks AMAZING. Doing it in a laundry room might be more manageable - smaller budget and smaller space - although the wallpaper would probably be less time-consuming! oh my goodness, I am looking for laundry room inspiration and this is just to cool! thanks for sharing!